Gaby is simply fantastic! We had a lovely time. We tried new foods and new drinks and went where the locals go. Most importantly, we laughed and had a great time and made a new friend. Look no further - this is an experience you don't want to miss! Thank you, Gaby!! TOUR GUIDE RESPONSE: Thank you Kristy!!! I Spend a great time with your fun and lovely family. Your kids are very nice and your husband really enthusiastic. Thank you for doing my work so easy and enjoyable. Wish all of you the best in life!!! The mark of a great guide is when they are passionate but conversational, not on script, show a sense of where our interest and experience are — and make the whole experience real and personal. Gaby and her partner at Alhambra, Patricia, were all this and more. It was like spending three hours with friends who taught us a great deal, made us see little details we never would have, and brought to life one of the best sites we have ever visited. Wonderful insight on Spain and local flavors as well. Wonderful tour... highly recommend it. Well organized and thoughtful. TOUR GUIDE RESPONSE: Than you very much Mary! Best wishes for you and all the girls! Gabriela is an excellent guide and very adaptable. She was perceptive to modify the walk around the city to fit us. We saw many beautiful sites and understood them better because of her clear explanations. I especially enjoyed her narrations of historical personages. I would definitely seek her out for another tour. Gaby was great. We took this tour upon our arrival to Granada and it proved to be the perfect way to begin our visit to Granada. Gaby was super responsive leading up to our visit and provided many helpful suggestions on how to manage our visit, in both the weeks leading up to our visit and during the tour. Gaby was informative and enthusiastic. The tour covered a lot of ground in terms of the breadth and quality of the information commmunicated and the sights seen. I highly recommend booking Gaby. Wonderful experience exploring the highlights of Granada. We acquired a deeper understanding of the history and culture of the city and the sense of pride taken by the residents. Gabriela was knowledgeable, companionable, and thorough. We enjoyed our time with her and learned a lot. Many thanks! TOUR GUIDE RESPONSE: Thanks for the great review, Lynn. Yoy and Louis are really nice people, was very good to share my afternoon with you both. I wish you all the best!!! Gaby was an excellent guide. I really recommend the added tapas and wine part of the tour. It was fantastic to get a bit of the cultural background of how to order and eat tapas like a local. 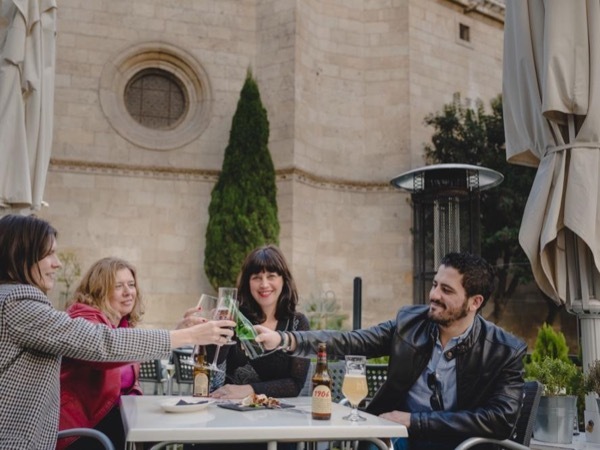 If you want an extremely fun and authentic experience, then this Tapas tour is for you. Gabriella is a wonderful and extremely funny guide who navigated us through the Spanish ritual of tapas. All of the places we went were local haunts and we would most likely would have never found them but for her expertise. The local customs, ordering, the differences in the wonderful Iberian hams... vermouth tasting (I don't even like vermouth but this was excellent! )… it was just a great time! Thank Gabriela, our tour with you in Granada was the highlight of our visit. Honestly. We highly recommend this walking tour to anyone visiting the city. We did the walk on our first morning and so thankful we had such an orientation. Gabriela is a wealth of historical information, guided us through streets and locations and views we simply would never have discovered. Recommended incredible places to eat. We we very happy. Gaby was a phenomenal guide! She was open to our interests and incorporated them in the planning of our three hour tour. She explained each and every landmark thoroughly, and made the tour abundantly easy for us, as well as entertaining. We loved our time with Gaby and now wish we were staying in Granada a little bit longer so we could join one of her other tours. We highly recommend Gaby! TOUR GUIDE RESPONSE: Thank you so much for your wonderful feedback, Ben and Gregory! You are really nice people and make my work very easy and fun. All the best for you and Gregorio!!!! Gaby was great. She has a fun personality, good English and a great knowledge of Granada. In addition she emailed us details of good local restaurants. I would highly recommend her. TOUR GUIDE RESPONSE: Thank you so much for your wonderful review. I'm very grateful you have enjoyed so much in the Alhambra tour. Hope to see you again, same day. Best wishes to you and Mike!! Gabriela is. a FANTASTIC Local guide. She made the sights & history of Granada come alive! We enjoyed every minute our tour & provided many helpful suggestions. We highly recommend Gabriela M. Many THANKS, Larry & Donna. TOUR GUIDE RESPONSE: Thanks so much for your wonderful review. You are a great couple and that makes my job very easy :) All the best for you both, Larry and Dana. Hope you enjoy your days in Andalucia very much!!! Wonderful, knowledgeable, warm, and kind guide. Must hire Gaby when you visit Granada! She made our one day visit to Granada possible and so much more enriching. Thank you so much Gaby! TOUR GUIDE RESPONSE: Thank younso much for your wonderful review, Jasmine. A lovely family, very friendly, cultured and interesting in the Granada history. A memorable day :) All the best for you, next time you're in Granada, just call and we'll go for tapas!!! Tour was great. Very knowledgeable re the Alhambra. Very considerate guides - went out of their way to help us. TOUR GUIDE RESPONSE: Gracias Jaime por sus 5 estrellas. Los mejores deseos para Elvia y para ti!!! Excellent tour. Gaby was very flexible in asking what our priorities were. She also took us to a tapas place for lunch which we would have never found on our own and introduced us to Tinto Verano (red wine mixed with lemonade) which none of us had ever tried before. TOUR GUIDE RESPONSE: Dear Saul thank you so much for your review! We all had a great day together. You guys are a very funny and interesting group. I had a lot of fun and I'm glad you know now, that Tinto de Verano is much better than the famous Sangria!! All the best for all four of you..
Gabriela was great, she steered us in the appropriate direction for right time of day to visit Al Hambra. She was on time, appropriately adapting tour to our desires. She was attentive to our needs with out being too intrusive. Her conversation level and explanations were at exactly the correct level for us. Would highly recommend her. Gabby was an amazing guide, personalising our tour to not only incorporate the highlights of Granada, but also the other places we were keen to see. Her knowledge is extensive and we learnt a great deal about the history of both the City and its peoples through the ages. Gabby is loads of fun, so what better way to spend the day! I would recommend Gabby for any tour of The Alhambra and Grenada generally. 5 stars all the way. This was our 5th tour by local tour during our trip to Spain. While our guide was super friendly and helpful with taking pictures, it appears she is not licensed to conduct tour herself in the Alhambra. She seemed to subcontact to another excellent guide who was licensed so it felt like we over paid for our experience. We really enjoyed our tour with Gaby. She is an excellent guide and made the tour fun! Gaby is very knowledgeable and professional, two traits one hopes for in a guide. She was flexible too! We never felt rushed. It was an excellent tour and well worth the money ! A wonderful introduction to Granada. Five stars (more if you have them) to our excellent guide (Gabriela) in Granada on Friday, April 13. She made us feel like friends she was showing around her favorite things in the Albayzin, and we had a great time -- her English and her knowledge made it a special morning. She communicated with me by e-mail, confirming our pick-up time, and she was at the hotel promptly. TOUR GUIDE RESPONSE: Thank you so much for your great review Lou and Bob!! The intention of this Morning Tea in the Albaicín is that you can feel part of the city and a little local, too. Very happy to have succeeded :) The best thing for both of you!!! Gabby was the best tour guide. We wish we could rate her ten stars! She was helpful and knowledgeable. and we were treated like VIPs. Our tour of Alhambra and Generalife with Gabby was the highlight of our two-week trip. In addition, Gabby gave us tips on other things to do in Granada. TOUR GUIDE RESPONSE: Gracias Ramon por su feedback! Gabby was excellent and took us to some great places that we probably wouldn't have found on our own. We went with Gabby the day we arrived in town, after a long flight and her energy was contagious. We had a blast! It was a fun and yummy first tour to take in a new city! Thanks Gabby! TOUR GUIDE RESPONSE: Thank you very much for your wonderful review! We spend a great day and have a lot of fun! All the best for you and your nice family! Gaby met us at our hotel and accompanied our group to the Alhambra. She provided great insight along the way. She obtained the tickets for us in advance and arranged for a wonderful guide of the Alhambra and Generalife. After the tour was over she gave us advice about dining and what to do with the time we had left in Grenada. I would highly recommend her. TOUR GUIDE RESPONSE: Thank you so much for your kind feedback! Hope to see again once more time :) Best wishes for all of you!! TOUR GUIDE RESPONSE: Thank you very much for your wonderful review, Tracey. We really enjoyed a beautiful day and this lovely city. You and your husband are very nice people. Best wishes to both of you!! Very good start to our time in Granada. Gave us the lay of the land and orientation. My tour with Gabriela ("Gaby" pronounced "gabby") was a highlight of my week in Granada. I truly didn't feel as if I were on a "tour" (not that there's anything wrong with tours). Rather I felt like I was being shown around the neighborhood by a good friend and long-time resident. We ate and conversed as locals, and everyone she introduced me to (spice shop owner, local baker) was friendly and memorable. I will probably ask her take me on the exact same walk on my next visit to Granada. A great tour and fascinating insight into the city and especially the food. Would highly recommend. TOUR GUIDE RESPONSE: Thanks Kav! You are a very interesting and fun person. I had a great time with the stories that you told me and such a delicious food and drink that we tried. All the best for you and your family!!! Gaby did a great job for us. We moved quickly and were able to see what we requested. Her English is excellent, and she is delightful to be around. Great tour! TOUR GUIDE RESPONSE: Dear Charlette you are an amazing person! Thank you so much for sharing your time with me. It was a great tour, you and your friend are lovley!!! Best wishes! Gaby was an excellent guide and I can warmly recommend her as a tour guide. Very skilled and very friendly. She did her outmost to make my tour as memorable as possible. TOUR GUIDE RESPONSE: Thank you so much for your feedback! Very happy you enjoyed the Albaicín and Sacromonte tour. Hope to see you in Granada or Frigiliana very soon! Gabriela was outstanding for our group.There were some areas we couldnt get to w/ a wheelchair,but she knew of accessible alternatives.She repeatedly offered to tour with the friend in the wheelchair to allow the rest of us to see the areas that had stairs.She had extensive knowledge of the history & architecture and cultural elements we were seeing.She also knew a lot about the plants in the many beautiful gardens. She was kind, thoughtful & highly qualified to make our a success! Five stars! TOUR GUIDE RESPONSE: Thank you very much for your great review, Bruce. You guys are one of the most incredible groups I've ever met. I love the way you share your travels and your friendship. You and Dorothy are great people. Just like your wife and William. I have learned a lot from the four of you and for me it was a truly unforgettable tour. I wish all of you the best!!!! Great day at the Alhambra! TOUR GUIDE RESPONSE: Thank you very much Kevin! This tour would have been a 5 star except the transportation from the port was a standard van which was very uncomfortable for the 2 hr ride each way. Transportation was billed as Mecedes "luxury" or equal and it was not. Our guides were excellent for the Alhambra. Make sure of your of you car or van will be comfortable. TOUR GUIDE RESPONSE: Thanks very much Michael for your comment. I regret that the transportation was not so comfortable for you. Very glad that you enjoyed the tour in the Alhambra so much I wish you all the best!!! What a wonderful experience visiting the Alhambra was, and we are so glad we booked a guide. Gabriela was a delightful, informative tour guide, and we would highly recommend her. TOUR GUIDE RESPONSE: Thank so much Rosalyn! Very happy to know you enjoyed so much the Alhambra tour. All my love to you, Rose and the 2 Davids!!! Gabriela was a great guide. This tour is a great way to skip the long lines at the entrance and she works with an amazing guide inside the palace. It Is really like getting two guides for the price of one! Gabriela's tour was excellent! She was highly knowledgeable, friendly, & welcoming. Gabriela made delicious food choices. I hope to meet again one day! I highly recommend her tour! Gabby gave a great tour. I would recommend it to everyone. She is very knowledgeable and engaging. She made the city and the Alhambra come alive. TOUR GUIDE RESPONSE: Thank you so much William I'm very glad you enjoyed so much this tour. All the for all of you!!!!! Garbiela was a terrific guide and a tireless walker! We had a great time and would have booked another tour with her if we had the time. Her knowledge and sense of humor kept even our two teenagers fully engaged even in the 100 degree heat. TOUR GUIDE RESPONSE: Thank you so much Bruce! We really walked in the hell (40 degree heat) hahaha. We spend a great time and enjoyed this beautiful city. All the best for your lovely Family!!!! Gaby was a wonderful and knowledgeable guide, her intimate knowledge of the Alpujarras area helped us understand about life in this country side. The tour started with a detailed history of ancient times and we appreciate how Gaby brought all the elements together to give us a picture of why things are the way it is today. We hiked from one village to another via an easy trail. By the end of the tour we had a rich knowledge of the villages. It was fun to taste the spring waters too! Truly unforgettable! TOUR GUIDE RESPONSE: Christina and Vincent, thank you so much for your feedback!! We spend a great time, you are an easy going and a friendly couple. It was funny to drink the carbonate waters and wet our feets on the streams!!! All the best for you both, hope to see you sometime with your kids. Excellent guide. Alhambra us not to be missed! Gabriela was excellent. She met us on time and was very knowledgable about Granada history and the Alhambra. We had a guide from the Alhambra with us and I wonder if that was necessary. Gabriela would have been able to do the tour on her own I suspect. TOUR GUIDE RESPONSE: Thank you very much Gail! I'm really happy you and your family found so interesting this tour. All The best for all of you!!! Gaby is an excellent guide, we thoroughly enjoyed our tour. She is very knowledgeable of the history of Granada, Andalusia, and the Alhambra. We recommend her very highly. Gaby is a wonderful guide who created a great walking tour for us to explore a unique part of her city. She was flexible and easily able to customize our experience to meet our interests. She clearly enjoyed sharing her extensive knowledge to enhance our understanding of what we were seeing and hearing as we explored the back streets of the Albayzin and Sacromonte neighborhoods. We would gladly book another tour with Gaby. I actually tried to give her a 5 start rating but something went wrong with the app. Anyway... Gabriela was awesome, really a great profesional, she is totally child friendly and gave us a lot of explanations and information about the city. She took us to nice spots to take family puctures. We had a great time and definitely she is totally recomendable. We arrived at Malaga by ship. Gabriela had arranged for comfortable transportation to Granada for our visit to the Alhambra. She also arranged for an official guide, Patty, at the site who was most knowledgeable. It is an interesting and historically most important site and we enjoyed it very much. We were picked up by a driver who did not speak any English, so the 1+ hour drive was done with no commentary. Gabriela met us at Alhambra, and quickly introduced us to an Alhambra guide who gave the complete tour (so why did we need Gabriela?). At the end Gabriela walked us back to the van, and said goodbye, as we headed back for another hour of silence. We would have been much better off to just book a tour through the cruise ship. We had a beautiful morning tour of the city with Gabi who was vey nice and knowledgeable. Highly recommended. TOUR GUIDE RESPONSE: Thank you very much Nadev. I hope you and your family enjoy as much as possible your holidays in Spain. Best wishes! TOUR GUIDE RESPONSE: Thank so much for review Farida! We spend a great time and I learned a little bit about your interenting culture. Best wishes all of you! TOUR GUIDE RESPONSE: Thank you very much Ali! Your group and you are very funny and friendly. I was very happy touring you. See you in Istambul!!!!! Gabriela was very professional, easy going,and very knowledgeable about our city and Alhambra tour...finished up with a delightful elegant lunch at the Parador......thanks. will recommend. This tour was great. One of the best experiences in Spain and traveling in general. The Alhambra is very crowded, so having the inside scoop makes the experience much best. Great tour and guide! Gabriela was a friendly and informative guide. We learned a lot about the history of Granada on our way to the Alhambra. TOUR GUIDE RESPONSE: Thank very much for your kind review. I wish all the best for you and your lovely family! Gaby was great! We took the Alhambra tour with her. She and the official Alhambra guide worked extremely we together. The Alhambra logistics can be quite daunting so having her made the whole visit spectacular. Everything went smoothly. She was very knowledgeable about the history. When tour was done she gave us lots of recommendations for other things to do and places to eat. TOUR GUIDE RESPONSE: Thank you very much Charlie! We spend a great time together, you and the group were very funny. I wish all the best all of you!!! Gabriela was a great tour guide - she was very informed and did a wonderful job showing us the beautiful city of Grenada. TOUR GUIDE RESPONSE: Thank you very much Cindy! Best wishes for you and Friends!!! Gabriela was fantastic! She was right on time to pick us up. She was very informative on the city of Granada and worked well with the Alhambra tour guide. After the tour she made a reservation for us at the restaurant we wanted to go to and even walked with us to show us where the restaurant was. Then she showed us a couple of other restaurants she thought we might like. We would recommend Gabriela to anyone who wants an outstanding tour guide. Gabriela was our tour guide but she brought with her a young vibrant Maria. This was our first Tours-by-Locals tour, but it will not be our last. The tour was wonderful. What made the tour so wonderful however was the knowledge of the tour guides. They were delightful and full of interesting details. It was not a typical tour where they say "and on your right" but it felt like you were being given a tour by a close friend that catered to you interests. We would highly recommend Gabriela and Maria. TOUR GUIDE RESPONSE: Thank you so much for your feedback, Charles. You and your party are so enthusiastic and fun. We spent a beautiful day at the Alhambra. Outstanding! Gaby is superior. Highly recommend. Really enjoyed the private tour of the Generalife and Alhambra. It is quite impressive. The ability to explore the Fortress and clime the tower is an experience not to miss. The views of the city are breathtaking. Very happy with the wonderful tour. We could not be happier. A little more expensive for the private tour by so much better. Great first night in Granada! Not only did I get a crash course in tapas, I got a lot of information that helped me get more out of my visit to Alhambra the following day. TOUR GUIDE RESPONSE: Thank you for your review Clay. Very glad you enjoyed so much this tapas and ham tour and your Alhambra visit. All the best! Gabriela was an excellent guide ... charming and engaging! She met us promptly as arranged, showed us everything she promised, explaining the details of each site thoroughly and in nearly perfect English. Our walking tour of the Alhambra with the guide that Gabriela arranged was easy and entertaining, with very little waiting, though there were tons of people at the monuments. It all went so fast and we were sorry to have to bid her "Adios". TOUR GUIDE RESPONSE: Thank you very much for your geat feedback. I hope you are very well and next time you came to Granada call so we speak in spanish with a deliciosos chocolate with churros!!!! Gaby is an excellent guide and was very considerate of our need to take a break due to the heat. She is very knowledgeable and I would highly recommend her. TOUR GUIDE RESPONSE: My pleasure Gillian, thanks for spend with me a day in my loved city. All the best for you and your friends! Gaby, was great! Excellent tour, fascinating detail and great tapas lunch. Highly recommend. We were a group of ten with five kids and a senior and everyone was captivated. TOUR GUIDE RESPONSE: Thank you very much David for your wonderful feedback! I hope you spend a geat time in Spain. Best wishes to your lovely family! We loved our tour with Gaby. Her knowledge of history and of the Alhambra is vast and she was able to present the history with interesting stories and enthusiasm so that even our nine year old was engrossed. It was so nice to have a small group so we could move easily through the vast area and ask questions as they came up. We are grateful for our time with Gaby, her English is great and she was also willing to switch between Spanish and English for our mixed group. Highly recommend her! Albayzin tour with Gaby was excellent. Thank you so much. Gaby was delightful and knowledgable. Beyond sharing the history of the city, she took the time to write out several note pages of places to visit and to eat after we inquired. We would strongly recommend her to friends considering a guide. Gabriela was a very good tour guide. Because of government regulations, she had to hand us off to an official Alhambra tour guide, so we mainly used her services for our walk around Granada city. She took us around to key spots in the city and pointed out some great places to get local food, which we very much enjoyed revisiting later in the day. We always ask a lot of questions, and she was gracious to answer all of them. Nice day! TOUR GUIDE RESPONSE: Thank you very much for your nice feedback! We spend a geat time together. Best wishes for your lovely family! Gabby was a great tour guide. Really enjoyed seeing this side of Granada. Would recommend. Gabby and Enrique were great. So personable, and so full of great historical information about the city and Alhambra complex. Probably our favorite tour ever! Gaby, thank you for showing us your fabulous city. You were so patient with two old folks! Not only did you show us the sights and give us the history but put it into a social context. Our lunch and coffee stops were perfect. A pleasure to meet you. TOUR GUIDE RESPONSE: Thank you very much Ilya! Pleasure meet your lovely family. Best whises and Happy New Year!! TOUR GUIDE RESPONSE: Thank you John for your review. My husband and I absolutely loved Gaby! She was knowledgable and informative but never boring! Our guide in the Alhambra was also very informative and worked well with Gaby to provide a totally great experience for us. Our tapas tour later that day was fun and delicious, and Gaby gave us great options for the rest of our trip as well. Altogether it was a wonderful day and a great trip!